These cute Mini Omelette Cups are a great addition to a weekend brunch. Deli ham slices replace the traditional pie crust in this lightened-up version of mini quiches. Spray 12 muffin pan cups with cooking spray; line with ham slices. Fill with spinach, onions, peppers and cheese. Whisk eggs and Miracle Whip until blended; slowly pour over filling in ham cups. Bake 20 min. or until centres are set. Serve with whole grain toast, roasted potatoes and a fresh fruit salad. 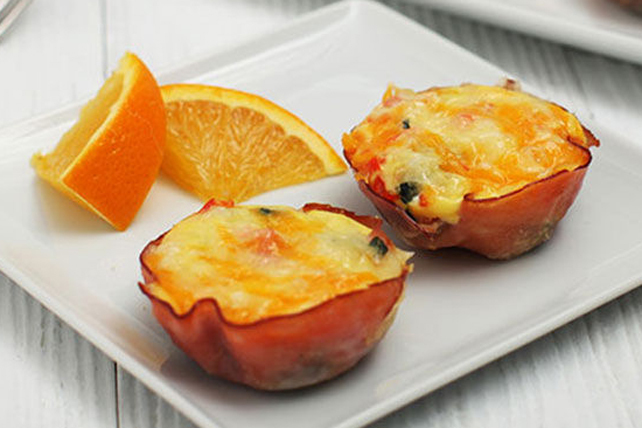 Fill ham cups with vegetables and cheese. Whisk eggs and Miracle Whip until blended. Refrigerate both, separately, up to 24 hours. When ready to serve, stir egg mixture, then pour over filling in ham cups and bake as directed.